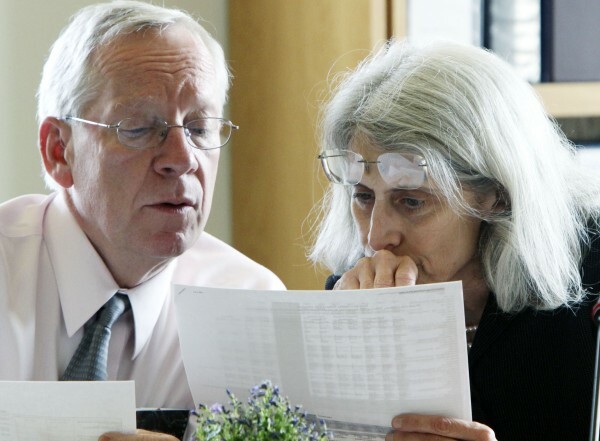 Maine Reps. David Webster, D-Freeport, and Margaret Rotundo, D-Lewiston, pour over documents during a work session at the legislature's Appropriations Committee at the State House in Augusta, Maine, on Monday, June 6, 2011. Maine lawmakers continued working their way toward an agreement on a $6.1 billion state budget. With little fanfare, the Legislature’s Appropriations Committee has in recent months approved three budgets with unanimous votes. The most significant, of course, is the spending blueprint for the next two years, which the committee completed Thursday night. This shows that despite sometimes heated rhetoric and often divergent views of the role and scope of state government, lawmakers can set aside differences to reach an agreement that, while far from perfect, addresses major concerns in a reasonable way. Among the most contentious aspects of the $6.1 billion biennial budget are pension reform, tax cuts and social service reductions. Here, initial proposals that were punitive and shortsighted were reworked by the Appropriations Committee. The committee, for example, eliminated a proposed 2 percent increase in employee contributions to the state pension system, which was coupled with a similar decrease in the state’s contribution. This would have done nothing to decrease the more than $4 billion unfunded pension liability, a real problem that needed a real solution. Instead, the committee crafted a compromise to freeze state employee and retiree cost-of-living increases for three years and to limit them in the future. This, and other pension changes, will reduce the unfunded liability by about $1.7 billion. The budget passed by the Appropriations Committee also includes $150 million in tax reductions, most of which go into effect in 2014. Although pushing the cost of the cuts off to future years may create larger budget shortfalls then, cutting the state’s top income tax rate and targeting tax relief to Maine businesses is a small step in the right direction. Proposed cuts to the state’s social safety net, such as ending Medicaid benefits to 28,000 Mainers, were scaled back or eliminated from the budget. Benefits will continue for childless adults and funding was restored to programs such as family home visits and dental care, run by the Fund for a Healthy Maine. Proposed reductions in state reimbursements for general assistance provided by Maine’s largest communities were also eliminated from the budget. “When people really dedicate themselves to the process and negotiate in good faith, it results in a better package,” Richard Rosen of Bucksport, the Senate chair of the Appropriations Committee, said Friday. “We proved once again that we can work together to find reasonable solutions to challenges that face our state,” Senate Democratic leader Barry Hobbins of Saco said in a statement. Members of the Maine House and Senate should follow this lead and vote for compromise rather than ideology. The budget needs support from two-thirds or more of the Legislature to take effect. There will be items in the budget that some lawmakers find objectionable. Others will be upset that things they wanted in the budget are not included. This is the nature of compromise. The Appropriations Committee is the only legislative body that examines all of the state’s spending needs — and wants — and balances that against revenue. The group is to be commended for crafting a reasonable spending plan that addresses both the state’s needs and its ability to pay.